Created by the fans for the fans, the first issue of the Wayfinder fanzine includes more than thirty articles designed to expand upon the world of Golarion. Inside you will find original fiction, new prestige classes, sorcerer bloodlines, magic items, and traits—and this is just a small portion of what awaits you. Originally released in print for attendees of PAIZOCON 2009, this PDF is your chance to enjoy what your fellow Paizonians have created for the community—for FREE! The PDF release of Wayfinder #1 is in full color and includes a special challenge by Tim "Timitius" Nightengale, organizer of the first PAIZOCON. Contributors: Adam Daigle, Ashton Sperry, Charles Evans, Claudia Burgos, Clinton J. Boomer, Colter Guthrie, Conceicao Hallen, Craig Johnston, Cristian Bodea, Crystal Frasier, Dave Mallon, Dennis Baker, Eric Morton, Ernesto Ramirez, Glen Zimmerman, Hal Maclean, Hugo Solis, Ian Cunningham, James Keegan, James Mackenzie, Jason Kirckof, Joseph Scott, Kelly Gragg, Jeff Lee, Jonathan McAnulty, Joshua Blazej, Justin Sluder, Kevin Coleman, Larry WIlhelm, Lissa Guillet, Liz Courts, Matthew Stinson, Michael Kortes, Michelle Craddock, Mike Welham, Neil Spicer, Raluca Rusu, Ross Byers, Russ Taylor, Paris Crenshaw, Tae-Bin Gulliver, Theodore Thompson, Trevor Gulliver, Troy E. Taylor. Cover art by Hugo Solis and Michael Jaecks. 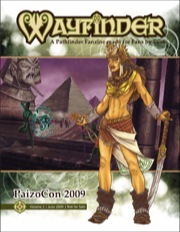 Wayfinder is a 77-page full-color PDF suitable for printing or viewing on your computer. It includes both Pathfinder Roleplaying Game Beta and OGL-compatible material for your enjoyment, and is released under the Paizo Publishing, LLC Community Use Policy. This fanzine uses trademarks and/or copyrights owned by Paizo Publishing, LLC, which are used under Paizo's Community Use Policy. We are expressly prohibited from charging you to use or access this content. This fanzine is not published, endorsed, or specifically approved by Paizo Publishing. For more information about Paizo's Community Use Policy, please visit paizo.com/communityuse. For more information about Paizo Publishing and Paizo products, please visit paizo.com. Wayfinder 1 is like a step back in time and a preview of the great things to come in later issues. I am going to try and review each article and artwork separately in just a few lines, and assign an individual and overall score for the content. I will attempt to score the articles and art as I would have had I reviewed at time of release and not let the maturation of this production over the years to have any negative effect on my reviewing of the early issues. The cover art is Osirion inspired, and might lead you to think the issue is Osirion themed, however looking at the index quickly shows a great diversity of content. I liked the cover. The forward, by James Jacobs, actually made me realise just how like all of us these lucky Paizo staff are. I haven't met James in person (at time of writing), but I can fully empathise with his inner geek that shines through. The accompanying monotone art is quite evocative, very mystic and mysterious. The first full article provides 23 regional traits for PCs of Osirion descent. There is a great diversity of traits here, all providing some really interesting benefits coupled with great flavor and role play opportunity. The artwork, a black and white line art with intricate detailing is just begging to be colored in. It lends an appropriate Osirion feel supporting the article flavor very well. The first story article takes us to Ustalav, depicting a dark journey through gothic wooded lands. It gave me some great ideas to add flavor and suspense to in game travel. A well crafted and executed story. The accompanying artwork depicts the camp-fire scene and assists greatly in mentally picturing the main characters of the story. The first reference to these sidebars that are dispersed throughout the magazine occurs on the second page of The Road to Varno. They provide a comedic turn on the "Agony Aunt" question and answers found in newspapers and magazines. I chuckled many times enjoying immensely these snippets of controlled madness. I decided to score these as a whole rather than individually. Next up, a collection of small drop-in encounters set in Darkmoon vale. The first introduces the party to malevolent pixies and offers some hectic fun, the second is darker and more sinister offering a CR 2 encounter that had interesting possibilities for role play, and the last encounter set in a carnival market highlights the diversity of these encounters. As a time pressed GM, I love quick drop in scenes like these, especially those set in villages and towns. Encounters in order of presentation scored 9/10, 8/10, 9/10 respectively. For my personal taste, the accompanying artwork didn't quite "gel" with the encounters. Next up is a story vignette presented in a series of journal entries very reminiscent of the journal entries found in the Adventure Path products. It presents a quite dark tale that leads into a very detailed NPC write up and Stat block for the main protagonist. The artwork clearly portrays the anguish of the lead character and the grey scale shading presentation makes it that much more gritty and in theme with the dark tale. The next article presents us with a prestige class, a nice spin on the dervish theme coupling it with a worshipper of Sarenare. I particularly liked how the fighting style of the dervish was built as a set of "dance" abilities. The artwork portrays the whirling dervish feel and is another clean black and white image that is begging me to bring out the crayons. Next up is a quite moody piece, a short vignette of life in Old Korvosa, accompanied by two pieces of art, the first a scene of the beginning of the story, setting the mood nicely, the second being a nice character sketch of one of the main characters. What is very nice about this story is that the characters it introduces continue their adventures within pathfinder chronicler. This story appealed to my love of gothic and moody and the art supported it very well. I loved this article – one of the most original ways of introducing a new creature I have ever seen in print, fully deserving of a maximum score. It begins with a cooking recipe - one of the ingredients of which leads you to a very nice aquatic crustacean. The accompanying art lends a comical twist via the use of a goblin chef which somehow meshed well with the light hearted approach to the creature’s introduction. I love articles that mimic the journal style found in the adventure paths – they immediately feel like pathfinder material right off the bat. This article provides just such a journal and there’s a dragon. Ticks all my boxes. The art is more cartoon than pseudo real, but it did make me wonder if this artist could do a whole fantasy comic page in a similar vein to this piece. It’s almost like the issue knew that I love journal styled articles. This one has a nice Golarion themed children’s verse as set up for the main journal entry itself. Both pieces of accompanying art could be printed and stuck to blank item type cards for use as “show then tell” for your players. As with all good journals, you are left wanting more, wondering what happens next – this article is a great example of a well-paced journal entry. Oh my, I’m being spoilt – another journal styled submission this time in one of my favorite areas, Qadira – I love me some Arabian Nights. Again, a nicely paced article over three separate journal style entries that evoke the Qadiran theme very well. The artwork representative of typical Qadiran meal fare really supports the theme and flavor (sic) of the article. And a fourth journal styled article in succession – we have to remember this is the very first issue, so should not let such repetition distract from the quality of the article – and if you download subsequent issues, you see less and less of this repetition in article arrangement – do not let this put you off from the rest of the issues. The article presents the story from the view point of the main protagonist, in a diary voice style. It also introduces us to a new wondrous item, fully statted out – so that’s another bonus. The art is of the protagnist recording her thoughts and actions, in colour and reeking of pathfinder style – well done. And a fifth journal styled article presenting the thought processes of a typical pathfinder - the internal construction is of the investigation and piecing together pieces of information. The old lady of the river is well represented by the art, a quite spooky piece that supports the article extremely well – one of my favorite pieces of art this issue. Next up is a more traditional short story about a very unusual character. I didn’t feel so much the pathfinder vibe, the presentation and the accompanying art arising from the article lending a cthulhu feel. That said, the line art is a very fine line art that is intricate, fun, evocative and begging to be colored in! I myself probably wont color it in for fear of ruining it – it’s that good. I liked the presentation of this Chelaxian themed submission, executed in the manner of talking to your diary as you write. The main creature played to my personal fears, I don’t like buzzing flyers in fear of wasps, hornets and bees and there is one mother of a bee as represented by the accompanying art. Next up is a nice short vignette regarding the ships of Leng and their Black Sails – slavery is touched upon from the eyes of a slave. The artwork accompanies the article well, and the cartoon at the bottom of the second page is something that could be right out of the Grimtooths traps books. Another nice vignette, again following a Pathfinder journal / report style, comprising the details of the acquisition of an article of antiquitynavigating false chambers, illustrating tomb delving in some detail. The artwork struck me as Mummy film inspired, depicting a sarcophagus whose lid represents the entombed in a very Tutankhamun representation, before which a swarm of beetles rushes towards the viewer. Another pathfinder journal, written from multiple pathfinder viewpoints. The first in a pompus noble borne voice which, while fun at first quickly became tiring, but that may just be me– it is certainly food for thought for Talador / knight errant based play. The next journal entries are written by a minotaur struggling against “monster prejudice”. The third view point is from a quite vengeful and protective sorceress. I did find this article confusing because the journals weren’t merged into a single chronological order. White on black character portrait style art pieces accompany this article, representing each pathfinder reporting. Next up we have a collection of poems and songs of various lengths – a really great page to keep behind the GM screen and use when the local bards peddle their wares. No art accompanied these poems, which is a bit of a shame – I would have loved to see some art based on the Faerie Army poem. A short and unusual story that I found very intriguing, and useful as a GM – evil grin. I won’t say anymore as it would spoil the plot so easily, but is a well recommended read for when you have 5 minutes to spare. I really loved the initial color art atop the start of the page, have a pseudo real/Disney cross style of presentation. I just loved it. Next up, some Tian Empire flavour, the first section detailing how a raid to retrieve a magical urn goes awry… leading into a new bloodline - Ancestral. My gut feel is that the link between the powers of the bloodline and your PC ancestry is tenuous, maybe it should have been linked through the powers to your parents, then your grandparents, each successive power drawing from a deeper link to your heritage. That’s just a personal feeling though: for an ancestral bloodline, I wanted more ancestry. Nice clean art, supports the story and the bloodline, the urn art particularly firing the imagination. A very flavorful prestige class is next, suitable for clerics and necromancers to employ, and the prestige class also lends itself as a nice template to be added to undead to throw at unsuspecting players. The abilities tied in well with the Urgathoan theme. The banner art is quite stunning, another of my favorite pieces this issue. A very well themed collection of traits and feats are found here, all for those who want to specialise in the hunting of the undead. They are not restricted by race or class and so are viable options for all, some fitting very well in more recent occult and horror inspired products. A nice lead in art of a hunter at the foot of a cloaked statue evokes the feeling of a hunter praying for success in an upcoming hunt. Next we have a nice moody themed offering that evokes Ustalav through and through. It begins with a journal entry that leads to a new disease (although I myself see it more as a curse, but to each their own). Then the fun part, adding a new template (wretched) to creatures. There are some creatures, that adding this template too, would make for very interesting and deadly encounters for your PCs. The artwork that accompanies the article evokes wretchedness very well and so supports the article nicely. Absalom tied character traits, split into religious and regional collections are the meat of this article. My favorite religious trait has to be Hero of the Hall as it offers a rare benefit not often found in the main rules. For regional traits, my favorite is the Dancer of Kortus, also the chosen by the artist it seems. The accompanying dancer art is quite stunning and full of detail. A short story, with a Geb / Nex flavor involving great relics, flying machines and the men that fly them now greets the avid reader. The style lent itself to a notes or letter for a Pathfinder journal, a personal musing if you will, leading one to wonder if the writer got home safe or not to file that report. The artwork is definitely drawn from and supporting of the story. OK, reaching the character / word limit now, so the remaining items to be reviewed will be posted to the comments along with the closing summary for the issue as a whole. The completion of this review is now found here. Enjoy. You didn't pick one up at the con? What's wrong with you people?? Umm, I didn't attend the Con? It's awesome, you guys! You should all be incredibly proud to have put together something this great! I somehow missed the discussion about this leading up to Paizocon, but I would just like to thank all the contributers for putting this together (and making it available to us)! Can’t wait to have a geez at it. This is so incredibly cool! I can't believe some of the artwork, simply amazing. I also really giggled at the mermaid cartoon. I haven't sat down to actually read the articles, but I will. And the goblins chasing the poodle was an awesome inside joke. Now I have to find something to contribute to next year's volume. Contrary to the name, I'm not much of an artist. My drawings aren't very good unless from a model. Maybe a guide to painting one of the iconics? I'd really like to make a remove-and-assemble something, maybe patterns for a cardstock building or a set of dungeon tiles? I guess I have a whole year to prepare, and to think. Arms too short to reach the con from South Carolina... trust me I tried. Nothing wrong with us :twitch: :twitch: people. You can't stop me with you mind control lasers!!! Those are some nice tasting socks. AAAAWWWWEEESOOOOOOOOOOME JOB! Thank you. I'm done. Some of us were not at the con Russ! I was never more proud of giving someone money for advertising than I was helping out this project. Butterfrog, Lilith and all the rest awesome work, be proud be very proud. The foul Libellus Facie has been a blight upon the face of Golarion and the Great Beyond ever since its creation. Unlike many great evils, it has no history, having only revealed its foul presence in the past few years. That presence, however, has been great and terrible. Its ravenings appear to know no end. This...Book...if you will, appears innocuous at first, seeming to be a useful aid for a magical form of communication and 'networking'. As time progresses eventually the tome will devour the user's face, adding it to the already enormous collection of flayed faces within. Each time the user open the Libellus Facie, there is a 1% cumulative chance of it devouring their face, adding it to the collected innumerable pages within. The user invariably dies without their face, though a carefully worded Wish or Miracle might save them if the cast succeeds at a caster level check against the book's enchantment. Suggested means of destruction No one must ever even think about reading or using the Libellus Facie again. Ok not got the read it yet but it's just gorgeous every page it does not look fan made at all . hahahahahaha... said through the lipless remains of my tattered face! Big time kudos to all involved! Just downloaded it. Great job, guys! Yay! Getting it right now! AWESOME! It's even prettier in color & on my computer! Finally got to look through it. Damn fine job. You guys are crazy awesome. Oh my. This is incredible. For lack of a better word: AWESOME. Added to my downloads, shame I can't download at work. Thank you all for a) making this and b) making it available for download. Thanks guys... an enjoyable read. Well done all of you....Wayfinder is Super Awesome. Masika lets see if we can get more of us Aussies contributing next year. Thanks to those responsible and to Paizo for making it available, this helps mitigate not being able to got to Paizocon! The Quality of this project is simply stunning. Thanks to all the people that worked on this and to Paizo for distributing it to those of us that couldn't be there.